What is this thing with the funny title? It is also known as borscht, or beet soup. Barszcz Wigilijny refers to the type of barszcz served at the Polish traditional Christmas Eve meal, known as Wigilia (from the Latin "Vigil"). This is a vegetarian meal--no meat allowed. So this barszcz does not use a meat stock as a base like most barszcz recipes do. We celebrated Wigilia on Christmas Eve with friends, and here's how I made my barszcz wigilijny. To this I added about a dozen peppercorns, a teaspoon of salt, several parsley sprigs, and a bay leaf. I brought this mixture just up to a light simmer, then simmered on the stove for one hour. At the end of the hour, I allowed it to cool slightly, then strained it, pressing on the vegetables to get as much of the precious liquid out as I could. I then strained it again through a very fine sieve and allowed it to cool. You can make this ahead of time and store in the refrigerator for several days, or freeze for several weeks. Beets are the basis of this soup, so I took two bunches of small to medium sized beets, washed them and trimmed them, leaving about an inch of stems attached. I put them in a foil packet that was tightly sealed and roasted them in a 375 degree oven for about an hour, until tender. Once roasted, i allowed them to cool until i could handle them. Then, donning rubber gloves (not wanting beet-red hands for the holidays), i peeled them. The skins will easily slip off. Once peeled, I used a box grater to grate them on the coarse side. Rubber gloves really are a must for this messy task! Two additional ingredients were prepared in advance, however: mushroom juice and uszka. A day or so earlier I had made uszka. See my earlier blog post for that recipe. When making the uszka, I had soaked dried mushrooms in warm water to rehydrate them. I saved this "mushroom juice" for later use--in my barszcz. Now I was ready to make the barszcz. Here's how I did it. I put the grated beets into a small stockpot and added one quart of the prepared vegetable stock and about one cup or so of the mushroom juice. Over medium heat, i brought this mixture just to a simmer and simmered for about a half hour (you can simmer longer if desired). To this I added one teaspoon of sugar and two tablepoons of lemon juice, and a bit of salt and pepper to taste. I was now ready to assemble and serve the soup. To each bowl, I added four of the previously prepared and warmed uszka (you can warm them separately or in the barszcz). Then I added about 3/4 to 1 cup of broth, along with just a few of the grated beets (you can also strain them out to serve in a more traditional clear broth, if desired). Finally, i garnished with about a half teaspoon (or so) of fresh chopped dill. 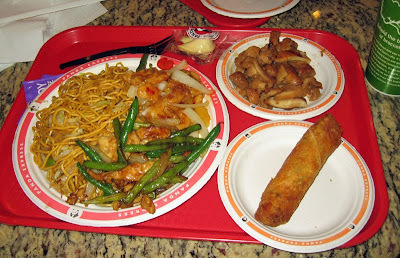 It's alway best to eat at Panda Express at a busy time of day--especially when I visit the standalone one that is near me, not far from the Seminole Mall. I find that the food is the freshest during busy times because they're constantly making it fresh. Going late in the evening or in the middle of the afternoon can find you looking at food that's been held quite a while, or having some selections not available. That said, the food at Panda Express is generally OK for what it is, American fast-food interpretation of some Asian dishes, mass produced. It was the week before Christmas and a friend and I were out and about, wanting some dinner. Not wanting to cook or venture far or be gone a long time, we decided to head to a nearby Panda Express and had dinner there. It was not bad for fast food and I was hungry. For my starch I had the chow mein--it was fresh so was pretty good The Sweet-Fire Chicken Breast was pretty good, though being breaded and deep fried, probably not all that healthy. It had just a touch of heat with a lot of sweetness from pinepple and red pepper. I was most disappointed in the String Bean Chicken Breast--some of the beans were nice and bright green and crisp, but others were dark green and soggy--an indication that they mixed fresh and "old" together to serve it. I expect better and we were there at a busy time. I also had the Mandarin Chicken, it was pretty good. To top things off I had a Chicken Egg Roll. It was very hot inside but kind of dry outside. Not terrible, but not really great either. Over all this was an OK meal but pretty much of a good value for the price and portion. Uszka is a Polish word that, literally translated, mean "little ears." 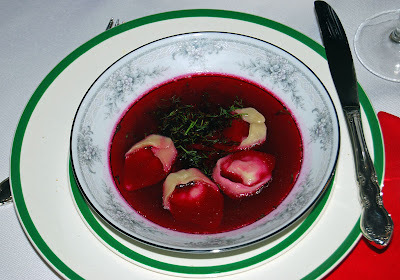 Uszka are small, pierogi-like (or ravioli-like) bits of a pasta dough that are stuffed with mushrooms, shaped sort of like a Bishop's hat, boiled, and traditionally served in barszcz (beet soup) on Christmas Eve for the Polish Wigilia celebration. Since I was having a traditional Polish Christmas Eve Wigilia at my home, I decided that this year I'd try my hands at barszcz, and as a result, need to make uszka. I read a lot of various recipes and finally combined them all and came up with my own interpretation. I used about two ounces of dried assorted Polish mushroom from the Polish store (EuroPol Polish Deli) in Winter Park, added about half ounce of dried shiitake mushrooms, and about an ounce of Wisconsin wild mushrooms that had been hand-picked and dried by my mother's cousin. I combined them all, added about 2 cups of warm water, weighted them down, and let they rehydrate for a good fifteen minutes or so. Once reconsitituted, I skimmed them off being careful to to disturb any sediment, and drained them. The "juice" i carefully strained and refrigerated for use later to flavor the barszcz. I chopped the mushrooms very fine. In a non-stick skillet, i melted about a Tablespoon of butter, then added one finely chopped onion and sauteed that about 5-10 minutes, until the onion was soft but not browned. To this I added the mushrooms and cooked till the mixture was very dry. Removing it to a bowl, i added chopped parsley, a Tablespoon or two of bread crumb, and salt and pepper to taste. Finally, added one beaten egg. For the dough I made my standard pierogi dough recipe. I've posted it here on my blog previously. 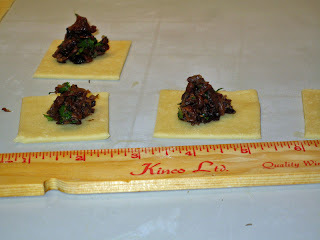 I rolled the dough out pretty thin, and cut it into 2 inch squares. But then i realized i needed it to be even thinner, so I rerolled, again cutting into scant 2" squares. Smaller fingers would help. On each square I put a scant half-teaspoon of filling, then folded it over corner-to-corner, making a "stuffe" triangle shape, and sealed the edges. Lastly, i pulle the two outside points toghther and pressed to seal, make what looks sort of like a bishop's hat--I had made some uszka! I made 36 of them--it is a very time consuming process. I had leftover mushroom filling and lots of dough, so I also made 9 regular pierogi out of them. But this is about uszka. Once assembled, I boiled and salted some water, then boiled the uszka in batches just until they floated. I coated with melted butter and stored in the refrigerator, ready to add to my Barszcz Wigilijny, Christmas Eve. There, I did it. And, as evidenced by all the comments Christmas eve, they were wonderful. Uszka have a wonderful flavor and are a very pleasant addition to the savory goodness of a fine barszcz. The woodsy flavor of the mushrooms is the perfect accent for the root-vegetableness (if that is a word) of the soup. The fact that they take time to make just increases their charm. It is well worthwhile to take the time to make them. Bardzo Smaczne! What a priceless gem we discovered in Sanford. Just off the beaten path, Cafe Papillon is located a scant half-block off of Hwy. 46 on Sanford Avenue. It is an "intersting" place. That is to say, there is nothing stuffy, fancy, or highbrow here. Just a grand and friendly place that serves excellent food. It was a damp but warm and pleasant Friday evening a week before Christmas when my friend Tommy and I decided to stop here for a late dinner. I'd called to find out how late they were open. I was told that they may close early if it was not busy but when told we'd be there around 8, they said "no problem, we'll be here." We arrived right around 8. First of, let me warn you, there is not a lot of parking. But I'd walk blocks if I had to in order to eat here again. We snagged the last available parking spot. Cafe Papillon is actually two buildings connected with an outdoor deck. The seating is comfortable, the atmoshpere very pleasant and somewhat Key-Westish. One building houses a gift shop full of seasonable collectables. There were some nice bargains to be had there--I'd go back just to browse. But we were there for dinner and we were hungry! When we arrived we were promptly greeted by the chef/owner, Mickael De Boucha. He asked if I was the one who called. We were quickly shown to an outside table (the inside is small and cozy, but it was a great evening to eat outside. Our waiter soon appeared. I asked what kind of ale beer he might have. He said he was not sure, but would find out. Less than a minute later, Chef was back at our table, wagging his finger at me saying "follow me." He led me to a glass case full of beer and proceeded to give the rundown of the various "classes." When he pointed to the American mass-market beers, i said "diswater!" He said, "no-no, it's pee-pee!" He then proceeded to tell the story of two guests at his restaurant, both of whom drank quite a few beers. The one drinking an American "lite" beer had to go to the bathroom after every bottle. The one drinking a more hearty beer, probably an import, never had to go once! Hence the title "pee-pee" for the beer! It was a fun experience. I chose a Smithwick's and he proceeded to accompany me back to my table where he produced a chilled glass and opened my beer. What service. Our waiter proceeded to take our orders. I had the Papillon Sandwich with a salad. The salad itself was very good, bursting with tons of flavor. Our waiter explained that they only use organic and fresh ingredients. You could taste the difference. It was an excellent salad. The sandwich itself was awesome. Sliced turkey breast, provolone cheese, Tomato, Greens, Mustard and Mayo were served on possible the best croissant in the whole world. 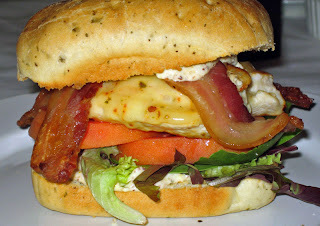 It was amazing, the butteriness and crunchiness of the croissant made a good sandwich in to an excellent one. All of the somewhat singularly ordinary ingredients, when skillfully combined as they were by the Chef and served with one of his amazing croissants, made for a wonderful meal. After we were stuffed, our waiter asked if we wanted dessert and mentioned some tempting possibilities. Anticipating the holidays and already being filled, we declined. He returned a minute or so later saying that Chef insisted we have an eau claire on the house... how could we resist. He retuned promptly with an extremely delicious eau claire. It was evident that this chef knows his pate a choix--it was excellent. 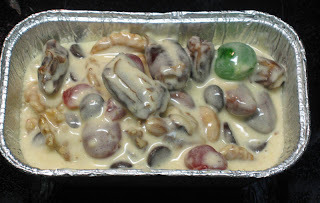 And the cream stuffing was out of this world to die for. Calories and waistlines be damned, we split it in half and devoured it. What a great way to end a meal. Some day, I'd like to return here just for dessert. We had a wonderful experience at Cafe Papillon. Warning: chef/owner likes to talk and will socialize with you. And you will love the dining experience. Not fancy food, just good food. We made a good choice when a coworker and I decided to have lunch at Stone's Throw Bistro recently. A very good choice. It was the Friday before Christmas and we were having a late lunch, so when we arrived about a quarter past one, there was only one other table occupied, though a large table that was not yet bussed was evidence of some earlier activity. It was a minute or two before our waiter--the long waiter--appeared, but once seated, the service was very attentive throughout the meal. Later on, a few more tables were taken. All parties were expertly space throughout the restaurant, very nice and thoughtful, though it certainly made for more steps by our waiter. We decided to start out with a soup of the day, a White Bean Chili. Now, it was a very good soup and had a nice depth of flavor. But the soup also gets my only complaint of the day--it was overly salty. But, beyond that, it was very good. We also had a salad. 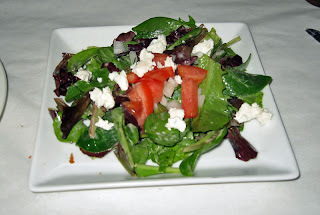 The salad itself was very nice, fresh mixed greens with a house dressing and included tomatoes, onions, and goat cheese. The onion added a nice crunch and the goat cheese and extra rich, creamy smoothness....if felt great in the mouth to chew on this salad, and the flavors all worked well together. 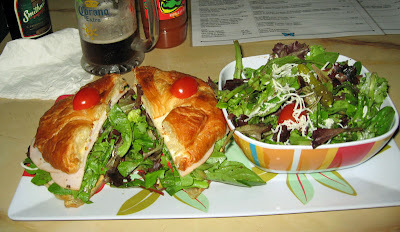 The salad was the perfect preamble to the sandwich that was to follow. For my "entree" i had the Seared Chicken Sandwich. It was an outstanding sandwich. First of all, I liked the presentation. 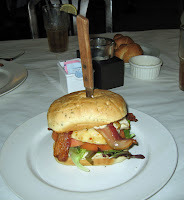 It was served on a rectangular whole grain bun and had a steak knife in it, as much to hold it together as for presentation and usefulness. It was a feast for the eyes. The chicken itself was nicely cooked, tender and juicy, cooked perfectly. It was accompanied by jalapeno havarti cheese which added interest and a hint of heat, hand cut bacon which added a nice crispness and smokiness, tomato which added a fresh note, and bacon aioli which added flavor, a herbal note, creaminess, and complimented all the other ingredients. 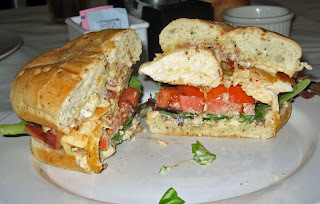 I'll tell you, this sandwich was a real hit with me and I would recommend it to anyone, any time. Our lunch experience here was excellent. The total meal including a generous tip (it was the Christmas season, after all) and tax was about $20. I got my money's worth for my eyes, my nose, my mouth and my tongue. Excellent flavors and a nice presentation made for a great lunch experience. I suggest you give them a try. I know I'll be back! 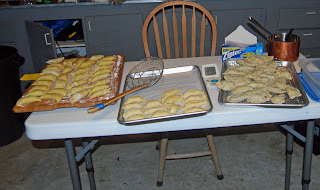 This year I hosted my 5th annual Pierogi Party. What is a Pierogi Party? 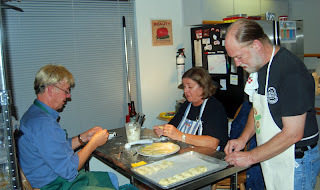 Well, a group of us get together and make lots and lots of pierogi. Last year we set a record at nearly 30 dozen. Yes, you read that right, 30 dozen! Generally, we make them primarily for our Polish Christmas Eve Dinner, called Wigilia. The Pierogi Party tradition started after I met the wife of a coworker, a wonderful woman named Ewa (pronounced evah) who is originally from Poland. As a second generation Polish American I was intrigued and we quickly became good friends. So we decided to hold a joint Christmas Eve (Wigilia) dinner and have done so ever since. In my family, we have always celebrated Wigilia, and I've always kept up that tradition. Before I met Ewa, I made my pierogi alone. Now we do it as a group, enlisting Ewa's husband, Joe, as well as various friends through the years. If you don't know a lot about what pierogi are and their history, i suggest you read this article, or any of a number of other things on the Internet. Over the years we've made several different varieties, but for Wigilia, we always have at least these three: savory cheese, potatoes and cheese, and sauerkraut and mushrooms. Of course, there's a reason for the "Party" part of Pierogi Party, and we manage to consume some other delicious victuals--as well as beer, drinks, and shots of Luksusowa Vodka during the party--though saved much of the liquid refreshments for towards the end of the evening....we do take our pierogi-making seriously! 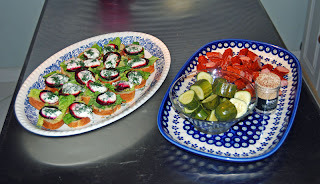 Appetizers were provided by Ewa and were absolutely delicious. She made an appetizer of crostini topped with bit of lettuce, a slice of roasted beets, a horseradish-greek yogurt sauce, and dill. It was wonderful, just out of this world! Also we had a plate of cut up Kabanosy (a thin smoked sausage) and pickles, again, very wonderful stuff. We did not go hungry at all. But, now about the star of the show, the pierogi making. 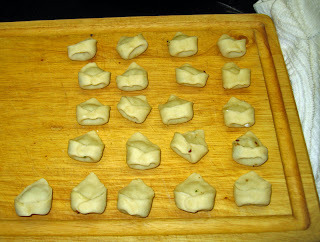 And I'm going to share my recipe for the world's best pierogi dough with you, too! For Wigilia we saved out two dozen of each (where we had that many). The rest Joe and Ewa took home as I'l have Wigilia here and so will have those leftovers. When we've had others join us in other years, we've divided them up as well. We were all in agreement, however that they were all winners. Then add two beaten eggs to the mixture. Knead a minute or two. Add a bit more flour if too sticky, but it will be just a bit sticky. Form into a ball, put on a plate or cutting board and cover with a tea towel, and let rest for 20 minutes. When it's rested, roll out thinly and cut out circles. One batch of dough will make approximately 36 3-1/2 inch circles. The recipe came from my mother's cousin Stella Kokaly who got it from a family friend, Lottie Szemeraj. As a person who has experimented with well over a dozen varieties of pierogi dough in my time, this is hands down the best ever. Here's how we divided the tasks. I made all of the dough (we ended up doing six batches). Joe began the rolling and cutting and rolled out the first four, I believe. Tommy and Ewa did the actually making... taking each round of dough and stretching it a bit, adding a precise amount of filling, then crimping and sealing the edges. As you can see in the pictures, we have a variety of sealing techniques. Ewa's is more dramatic, pinched somewhat reminiscent of a piecrust--as taught to her by her grandmother. Tommy discovered a fork works well. I just crimp crimp crimp by hand, how I've always done it and how my mother does it. 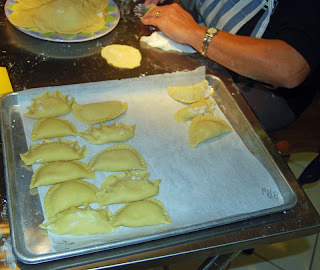 When i was not busy making dough, I jumped in and did some pierogin assembly as well. Once we had a bunch done, we began the boling process. 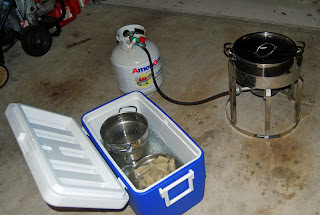 A number of years ago I bought a turkey deep fryer to use to make beer (I've never used it to fry a turkey!) and we use the smaller pot that came with it to boil the water and cook the pierogi. So once we got to that point, Joe went and began the boiling process, keeping meticulous track of what we made and what was on each tray. We boiled each batch for 5 minutes, then transferred to an ice bath to chill them. After that they went to "storage phase." Once Joe moved to the cooking station, I doubled as the roller/cutter as well as helping assemble when I had a moment. Ewa and Tommy were the real troopers who kept at it assembling the pierogi. We made and boiled the crab pierogi last, then change the water to boil the dessert pierogi. Meanwhile I cleaned up as Tommy and Ewa finished the last of the pierogi. Once everything was cooked, Joe did the storage and labeling phase. Two dozen of each of the six for Wigilia went into Ziploc containers and right into the freezer, the others went into appropriately labeled ziploc freezer bags (freezer bags with the double lock are the best!) and those went home with Joe and Ewa the next day. Once the dessert pierogi were boiled, I fried 8 of each variety in butter, then we sat down for dessert (with the requisite shots of vodka, too). I'd made a bourbon creme sauce for my bread pudding pierogi, and we also had the traditional sour cream accompaniment. We ate 28 of the 32 we prepared, and all agreed....they were all fantastic. Of course I had the guest room prepared, as after all the beer and vodka, though no one was really that tipsy, still it's best not to drive. We know how to party! 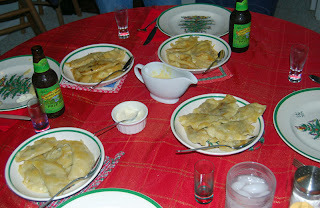 2009 was our fifth annual pierogi party and I'm sure we'll do it again next year in early December, thanks to good friends and a great tradition called Wigilia--it gives us the reason. I'll be sure to blog about our Wigilia too, especially since I'm doing some cooking for it. 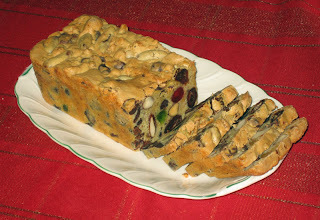 Bishop's Bread is, first and foremost, NOT fruitcake, though it contains fruits and nuts and candies. So what is it? 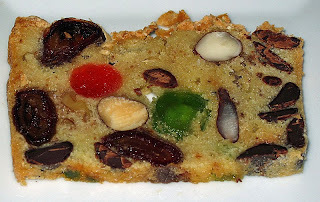 It is fruits and nuts and candies held together by a dry dough. It keeps well and travels well. Though it should be refrigerated for long term storage, it also ships well. Legend has it that Bishop's Bread got its name because it was what the local Bishop would take with him around holiday time as he travelled from church to church, tending to and visiting with his flock over the holidays. Because it keeps and travels so well, it was his sustenance while on the road--and presumably between the sumptuous meals provided at his very stops. Can't say that I've ever seen a thin Bishop in all the old pictures. Preaheat the oven to 275-degrees. In a large bowl, mix the wet ingredients (sugar and eggs) until well mixed. Sift flour and baking powder together (a pinch of salt is a good idea but not required) and add to wet ingredients. Stir just until the flour is mixed in. Do not over-beat. Now add the other ingredients and stir until combined. Disposable aluminum pans work the best here. Spray each pan with Baker's Joy (tip: spray in the sink or over the dishwasher door) or grease each pan and add wax paper (trust me, disposable aluminum is the way to go, it makes it very easy to remove the loaf once baked). Divide the batter evenly between the pans. Bake according to the guide above, but start checking about 15 minutes early. A toothpick inserted in the center should come out clean (unless, of course, you stab a chocolate chip--in that case, try again. Once done, remove from oven and cool slightly on a rack. When still warm, wrap in plastic wrap and store in the refrigerator for 3 days before slicing. To slice, us a very sharp knife, granton edge works best. If you do not have a very sharp knife, use a serrated bread knife or a bread knife. The Bishop's Bread cuts best when cold, but can be served at room temperature. This bread keeps for a long time. Some years ago, I found a leftover piece tucked in the back of the refrigerator in April--I ate it an it was still good. I have no idea how long it lasts in the freezer, it never lasts that long around my house. Variations? Of course you can. How about pecans instead of the walnuts. Different chips? Certainly. Don't like cherries? Try something else. Hazelnuts instead of Brazil nuts? Why not? No matter what combination you use, you'll love this recipe, I guaran-damn-tee it! There, now you have my secret recipe. Give it a try and leave me a comment. It's great for gift-giving too--as many of my friends and family can attest to. Bardzo smaczne! That's Polish for "very good eats!" Had lunch at Korea House recently with 11 coworkers and we all enjoyed it. I noticed a number of awards on the wall, though generally dating from earlier this decade. Still, there must be a reason for that. We arrived shortly after one on a Friday afternoon and were about the only people in the place. However, we were promptly greeted and our dring orders taken, then our food orders. You can imagine with a group of twelve that it can be confusing, but our waitress seemed to take it all in stride and was quite efficient. 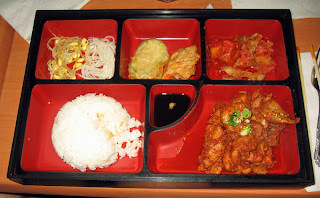 I had the spicy Chicken Bulgogi, a lunch special at $7.99. I have to say it was pretty good, condidering I'm not sure what all was in it. There was pickled ginger and bean sprouts in the upper left. In the center, two breaded and fried things, zucchini and carrot--I was surprise to find them served cold, but I guess that must be the way. On the top right was kimchi, it was nice and spicy; i recongnized the cabbage but there was another vegetable in it that I did not. However, it was good. Of course it came with rice, but the star was teh chicken. It was nicely cooked and nice and spicy as well as hot. I also had a bit of wasabi--it was nice and hot, I liked it. My only complaint was of the soy sauce--it was so so so very salty that it was almost unpleasant, I would have liked a bit but I could not eat it with all the salt it had. Our group had an assortment of meals and as far as I could tell, we were all happy with what we got. Would I go back here again? Certainly. I do not know much at all about Korean food but it was good and certainly a value. Give it a try! Wow, excellent Cuban Food can be found in Mount Dora, of all places! A friend and I decided to drive to Mount Dora to see Christmas lights and to eat. I'd done a bit of urbanspoon.com research and noticed what seemed to be a fairly new place with lots of good reviews. So when we were walking around on a late Sunday afternoon, we sought out Copacabana. The menu looked good, so we decided to eat there. It was a very, very good choice. Not being familiar with the menu, we browsed for quite a while, then asked our waiter for his advice. We were both in the mood for pork and he mentioned two dishes we'd each been eyeing, so we chose them. Good choice! My friend had the Pernil, tender cooked shredded pork with onions and seasonings, served with yucca, yellow rice, red beans, and green plantains. The look of ecstasy on my friends face told it all--he proclaimed it to be the best pork he had ever tasted. I had a few bites, I'd have to agree, it was outstanding. My friend had never had yucca before, but once he added a bit of salt and pepper--along with some chimicurra sauce--he proclaimed them a hit as well. I had the Masitas, tender chunks of pork that have been marinated and then deep fried and served with some onions, along with yellow rice, black beans, and sweet plantains. I thought I'd died and gone to heaven. The pork was very tender and very flavorful. The rice was typical, but the black beans were also very good. And the plantains were also very good. This was truly a very wonderful dish. I also had a side salad with mine and used the chimicurra sauce on that--good call, it was great. We asked our waiter about the chimichurra sauce and the owner came by and explained what it was--oil and garlic and parsley and a few other seasonings. Wow, it was so good. Our service was extremely attentive, and I noticed the owner around a lot, making sure all his guests were well taken care of, directing waiter, and talking to visitors. We had several people ask if we needed anything, and asking about the food. I am not a Cuban food expert, but if this one visit to Copacabana was any indication, I would like to become one. The food was excellent. My only regret was that I forgot to take any pictures. Well, I'll do that next time. With two iced teas, two dinners, and a side salad, our bill for dinner was about $23 with tax--a bargain considering the high quality and great taste of our food. I'd go back here again anytime, and recommend you give them a try. Well worth my drive from Lake Mary. 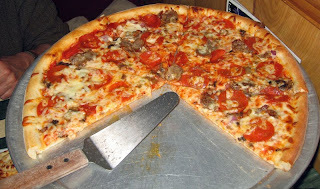 Great Pizza and other delights in South Daytona. We'd been to Pagano's before, had to wait a while, and decided it was definitely worth the wait. So when a friend and I wanted pizza a few nights ago, Pagan's was on our mind. Good call. We did not have to wait this time, but it was still plenty busy. We were quickly seated. As repeat patrons, we had an idea of what we wanted, and that was a good meal and leftovers. We were not disappointed. We decided to start off with Pagano's Famous Pin Wheels--pizza dough rolled up in a topping and baked cinnamon roll style. We ordered pepperoni and sausage, but our waitress quickly advised us to stay away from the sausage. She said our best bets were the pepperoni and the spinach, so we agreed. We had a full order, that is, four of each. They were served with a delicious marinara dipping sauce on the side. Each of our pinwheels was like a little bit of heaven. 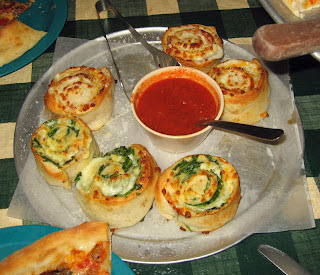 Sauce, pepperoni or spinach, and mozzarella cheese was perfectly baked in the pinwheel pizza crust. These were truly divine. They'd make a great meal all by themselves. But, we also wanted pizza, and so ordered a large (16") sausage, pepperoni, mushroom and onion pizza. It was served piping hot and was absolutely delicious. No one ingredient overpowered the others. The mushrooms were tender, the onions just a bit crunch, the sausage and pepperoni flavorful, and the cheese just a bit stringy. This was indeed very good pizza. But, this was a meal the had another life. We had plenty of leftovers and, with some extra marinara graciously provided by the waitress, we took about half of our meal home and had it two days later for lunch. It was just as good then as it was the first time. Two for one! What a deal. I'd recommend Pagano's to any pizza lover. So far, the best pizza I've had in the Daytona Beach area. 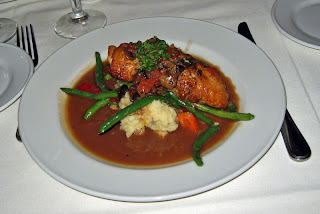 Antonio's in Maitland is a great place for a fine dining experience, and our dinner there recently was pretty good, overall, but missed the mark in a few areas. Antonio's in Maitland is a part of a small local chain. They have an upstairs upscale or fine-dining restaurant and a downstairs deli. Three friends and I made reservations on a Saturday evening to have dinner at the upstairs, fine-dining restaurant prior to attending a Trans Siberian Orchestra concert at the Amway arena. So this was a big event evening for us, dinner and a concert. We chose Antonio's based on past experience--always good food. And we knew it would cost us a few pretty pennies, but you get what you pay for and this was a night out on the town! When I called ahead to make the reservation, Gary answered the phone and was exceedingly pleasant and efficient. After taking my request, he enquired if there was some special occasion such as a birthday, etc., that they should know of and take care of. Exceptional service, I was impressed. We arrive early on Saturday evening for our dinner. 5:15 is kind of early to dine, but we had a concert to attend. 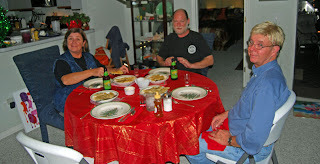 The dining room was fairly empty when we arrived, but did get busier as the evening progressed. We took some time to look over the menu. Our waiter came by several times to see if we were ready to order, and did a great job of explaining all specials and answering all questions, but we were not ready the first several times he checked. One friend asked if he could get the small beef filet prepared in the style of the large strip steak--our waiter checked with the chef and said sure, no problem. That was nice. Eventually we were ready to order, but then had to wait a bit--our waiter seemed to have disappeared, or maybe he just got tired of checking in with us. Eventually he did reappear and we ordered, but waited a bit long for that. At one point some excellent bread with olive oil was served and one friend asked for some butter--but, he had to ask a second time. Hmmm...first a bit of a wait to have our order taken, now to have to ask a second time for something? This was a bit of a disappointment. Overall our service was good, but it was not exceptional as it should have been. But on to the meal. Three of us did have a glass of wine. For most it was good, though one friend found the Riesling to be not sweet enough for his liking--more of a personal taste issue, I'd say, after tasting it. Our Ceasar Salads arrived in due time. I liked mine as it was very lightly dressed. All of my friends, however, professed that they would have preferred more dressing. Again, personal taste, but that's what it is. The salad was very lightly dressed. Soon, our entrees arrived and we were, in fine-dining Antonio's style, all served simultaneously. My first friend had the Filetto al Pepe Rosa, but prepared in the Bistecca alla Griglia fashion: that is, an 8 oz. filet mignon brushed with a mixture of oil, herbs, and garlic, then grilled over a wood fire. He proclaimed it excellent and was very pleased. My second friend had the Salmon alla Griglia, Salmon prepared in the same manner as the above dish: brushed with a mixture and then grilled. He too proclaimed it to be very good and was pleased with it. 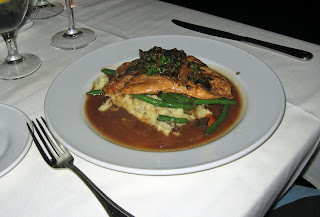 My third friend had the Pollo al Marsala, a breast of chicken that was sauteed with mushrooms and Marsala wine. It was served over a bed of mashed potates and with some barely blanched green beans. I do say barely blanched because they were. He did mention tha he thought they were not quite cooked enough, and I tend to agree--they should have been cooked a bit longer as they were nearly raw. The other components of his meal were very good--I had a taste. The chicken was tender, the gravy and mushrooms very flavorful. This was an excellent meal. I had the Ciabatta di Polo Ripeiena, a breast of Chicken stuffed with fontina cheese and prosciutto, brushed with a fresh tomato and mushroom puree, then baked in a wood-burning oven. I was not quite so impressed. The sauce was flavorful, the potatoes with the sauce/gravy were excellent. I agree about the green beans--though i like them crisp, these were barely warmed through, I thought. Though this was a stuffed breast of chicken, there was little evidence of the stuffing--I suspect the portion of stuffing was miniscule. Still, the flavor was good so that is not necessarily a bad thing. However, some parts of the chicken were a bit tough, especially the ends, the thinner parts. Overall this was a good dish and had nice flavor, but the chicken was a bit stringy in places. I probably would not order this particular dish again. Overall, we had a nice dining experience at Antonio's, at the find dining restaurant on the second floor. The decor is warm and welcoming, the staff friendly. Our service was a bit uneven, and our food was even a bit uneven, I think. But still overall, it was a good meal. With three glasses of wine, four salads, and four entree's, our total bill without tip or tax was about $125. Would I recommend Antonio's and eat here again? Definitely. Is it one of my top, top favorites--no, but still a good place for a good Italian food and dining experience. 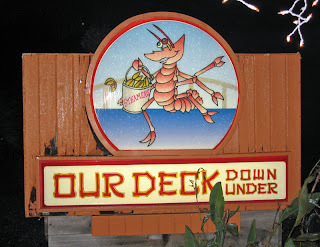 Our Deck Down Under is a fairly typical, on-the-intracoastal, fun and atmoshpere-centric food joint. The magic is in the atmosphere, not necessarily the food. Our Deck Down Under is in Port Orange, just south of Daytona Beach, right on the Intracoastal Waterway (Halifax River). Is is under the Dunlawton Avenue high-rise bridge--hence the name, I'd guess. I went to Our Deck Down Under with a Daytona friend on a rainy Friday night recently, during the "off season"--i.e., not the tourist season. He warned me that during the high season (and, I assume, on a much more pleasant evening) the place is jam-packed with cars and people everywhere. That may be true of the high season, but was certainly not the case the night we visited. However, it was a chilly and rainy night, very gloomy out. I imagine most tourists were still at home in the northern climate and most locals out doing their holiday shopping. The place was not very busy. However, it really does lend itself to outdoor dining--it opens up to the outside and appears to have quite a bit of outdoor and deck seating, right on the Intracoastal waterway--how cool is that? I can believe that it's a fun and very popular place on a summer evening. You order at the counter and they bring your food out to you. I have to say, the service was very attentive, possibly due to the few people there. Still, we never wanted for a beverage or any other request, all were filled promptly, and we were asked a few times how it all was or if we needed anything--much appreciated! We both ordered a good old standard for such a place, the fried fish and shrimp dinner. I had mine with onion rings, my friend had his with fries. The food was acceptable and what I'd call typical for such a place. Not gourmet cuisine, just good food. 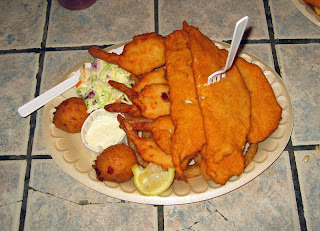 Six battered and deep-fried fish and three battered, deep-fried thin fish filets were served, along with the deep-fried onion rings/fries. A small dish of coleslaw was more of a garnish--only a few bites there. The fries were my least favorite part of teh meal, they were nothing at all special. The onion rings were a much better choice and they were pretty darned good. The fish and shrimp were as expected--hot and good (and of course, deep-fried!). How was it? Well, it was all I expected. It was a good fried-seafood dinner. There was nothing outstanding or exceptional about the food, it was run-of-the-mill fried food. But it was good. Napkins, shrimp sauce, and tartar sauce were all handy, right at the table. The beer was cold, the food was hot, the service was prompt, what more can you ask for when you're eating right on the water? Would I go back again? With friends or a group or out-of-town visitors after a day at the beach? Definitely, I'd put it on my list of places to take people. Was it a value? Well, at $13.49 it's a bit pricey, but you pay for the atmosphere, so yes, it was a value. It would be a great place to ignore the day's sunburn, throw down a few beers, eat some fried food (OK, they have grilled available, too, but what's the point at such a place? ), and relax along the water enjoying the night's cooling breeze. Give it a try, but on a nice summer evening to get the full experience, I'm sure! 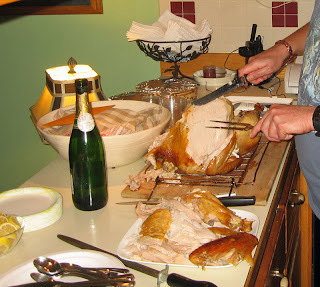 This is my report on my cooking for Thanksgiving 2009 and of our wonderful Thanksgiving feast. This year we had Thanksgiving at a friend's house, but I was lucky enough to be able to bring some of the food. Of course, all my friends know that I love to cook, so convincing them to allow me to do so was an easy task. I made two types of dressing. The first was from a recipe I got from Cooks' Illustrated: Spicy Cornbread Stuffing with Red Peppers, Chipotle Chilies, and Andouille Sausage (you may need to be a member to get to the link, or sign up for a free trial). First I found what looked to be a good cornbread recipe online (yes, with buttermilk and melted butter). Indeed, it was a great cornbread (though southerners might squeal at the bit of brown sugar in it). Then I crumbled, dried, and browned it. The cornbread itself was easy enough to make and uses chicken broth and half-and-half (and egg) for the wet ingredients. It turned out very good and just a bit spicy. Well, too spicy for some, but really, it was not that hot. It did make quite a bit. By the way, though the title calls this a stuffing, I made it as a dressing, that is, not in the turkey. The second dressing was my version of my mother's famous Turkey Dressing. You can find the recipe on my web site here. I used mushrooms this year too, to add a bit of depth of flavor. This dressing is always a popular recipe with my friends and I've been requested to bring it to various gatherings a number of times in the past. My friend said his roommate had bought several cans or jars of gravy, and I just gasped. "NO!" I shouted--let me bring the gravy! Fortunately, the gravy I made turned out great. I cooked some turkey necks with onions, celery and carrots to create a broth, then used that for the gravy. A roux of flour and butter (next time I'd go for a darker roux, cook it longer, but that's next time) and then the broth along with some dry white wine (Cabernet Sauvignon, if you're interested) which gave it a rich and slightly sweet note. The gravy was very good at well and we went through most of it (it made a quart). 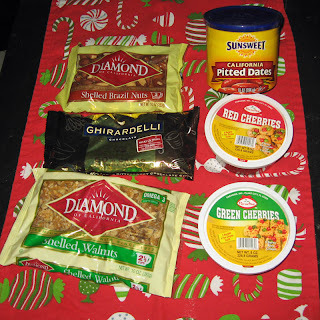 My friend also planned on jellied cranberries from a can--he does not like the seeds, but said i was welcome to bring some of my own if I wanted. How could I pass up and invitation like that. I simmered about a pound or cranberries in some water, added sugar and a bit of tequila, then the zest and juice of a lime. I added enough sugar to give it a bit of sweetness yet letting tart speak loudly as well. When finished and all the berries were popped, i let it cool a bit, then added enough additional tequila so you knew it was there, but just barely. It turned out very good. Kind of like a sweet cranberry margarita. Yumm. Also, I was requested to bring my Sweet Potato Balls. I baked about 4 pound of sweet potatoes in a medium hot oven for nearly an hour, until tender, then scooped them out of their skins. While still warm I pressed through a ricer, then mixed in cinnamon, cloves, and allspice (not too much, just enough to know they were there), the grated rind of and orange, a bit of brown sugar, and a few tablespoons of orange juice. Then i roughly crushed some corn flakes and added chipped, roasted pecans and a bit of cinnamon. 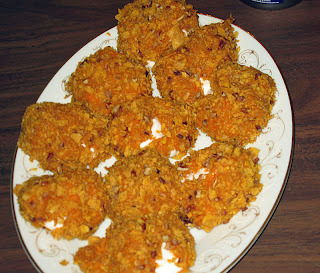 I took about 3 tablespoons of the sweet potato mixture and wrapped it around one large marshmallow, then rolled in the cornflake mixture and really pressed that in. By the way, this is a messy process, you need to use your hands and they will get rather messy. I refrigerated them and then baked them for about 10 minutes in a medium oven just before we ate. You know they're done when they begin to sag a bit--that indicates the marshmallow is melting. Do not over-bake or they will get very flat and very messy. These were a real hit and several people raved about them. Of course, mine weren't the only great creations we had for our Thanksgiving. We started out with an appetizer of 7-layer taco dip--it was excellent and a great way to prepare ourselves for the feast that was to follow. And before our meal, we had a round of Mimosas. Yumm! The turkey was the star of the Thanksgiving dinner, of course, and it was perfectly done. My friend brined it and it turned out moist, tender, and juicy. And two of the guests were professional cooks, so it was expertly carved. We also had a duck--delicious. 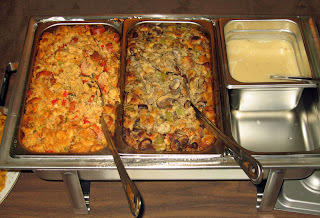 We had all the requisite sides including green bean casserole, potatoes, a rutabaga and carrot baked dish (was quite yummy), rolls, jalapeno corn muffins, and I'm sure more that I can't remember. I do remember taking small helping of everything, then going back for seconds on the turkey, dressing, and gravy. We all had a very good meal. Later (several hours later, thankfully) we had desserts. They were all home made as well. One friend baked an apple pie that was quite a hit. Another made not one, but two cheesecakes, both delicious--one was a pumpkin cheesecake, the other had chocolate chips on it and was equally yummy, though I forget exactly what was in it. There was also some pumpkin pie and sweet potato pie. We ate well, no doubt. As is traditional, there were leftovers, so we all got some things to take home. That was nice, too. 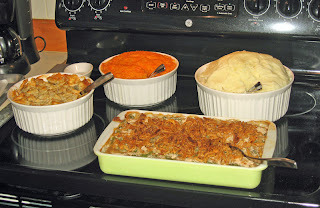 We had a very enjoyable Thanksgiving, and I got to cook. How much better than that can it get?